Visit Portugal and important places like Sintra, Cabo da Roca and Cascais and the beautiful Estoril Coast. Travel to Fatima via the walled city of Obidos and visit Batalha Monastery . Discover Fatima the famous World Pilgrimage site. In the morning drive from Lisbon to the romantic Pena Palace, a fairytale castle located in one of the highest peaks of Sintra mountain range. Later on free time to walk in the streets of the village of Sintra (Cultural Landscape by UNESCO) that enchanted Kings and inspired poets. Visit its handicraft shops and tea-rooms to taste the delicious local sweets like the "queijadas" or the “travesseiros”. Depart to Colares, a well known wine region and drive to Cabo da Roca, the most western point in continental Europe, passing by the beach of Guincho. Enjoy the landscape until we arrive in Cascais where we take a glimpse of the fishing port. 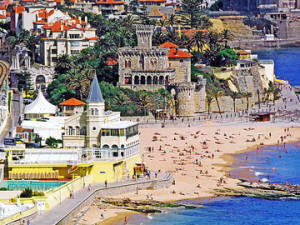 Return to Lisbon by Estoril Coast with panoramic view of the Casino and its gardens. Overnight in Lisbon. Morning departure from Lisbon, drive north and arrive in Óbidos, the beautiful walled town. Visit its picturesque streets and the Pousada do Castelo. After drive to Alcobaça to visit the 12 th century Church with the tombs of D. Pedro and Inês de Castro Stop for lunch in Nazaré, a colourful Portuguese fishing village. If possible go to Sitio for a panoramic view of the beach and the village. In the afternoon visit the Batalha Monastery, a Gothic masterpiece ,considered a World Heritage by UNESCO. Then arrive at the Sanctuary of our Lady of Fatima, centre of Christian faith and world pilgrimage. Visit the Basilica with the tombs of Lucia, Francisco and Jacinta, the Apparition Chapel , the heart of the shrine. If possible attend a mass. At the end of the day we will return to Lisbon through the colourful farming region. of the visit we taste some wines and olive oil. End of our services. Tour departs 9am from the Marques de Pombal Square in Lisbon or free pick up from Lisbon hotels. City packages / Lisbon page!